Catsmart was established by our founders, Raymond and Roger, with the vision to provide the local community with warm and caring cat services. With over 20 years of experience in pet industry and pet supplies, Catsmart is Singapore’s largest cat specialty store and we take pride in caring for your cat in the best ways possible. Like many good stories, CatSmart was born out of love for cats. Our team consists of highly focused and very specialised group of people, they are all experts in their own fields. 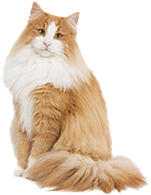 We aim to provide a wide range of competitively priced cat products for all cat lovers in Singapore. Our first and foremost priority is the cats' comfort and well-being. We believe in elevating every aspect of their experience, from thoughtful products to exceptional customer service. Our success is measured by the happiness of our customers and cats we served. Cats add so much joy to our lives and one of our values is to give back to them with the best. We love what we do and this is why we do it. As a total experience for both the cats and their owners, Catsmart is proud to be at the forefront of cat products in Singapore and we look forward to serve you for many more years to come! You can also shop at the convenience of your home at www.catsmart.com.sg.